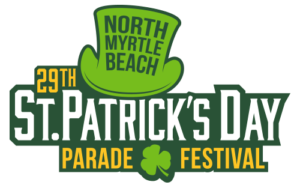 The 29th Annual St. Patrick’s Day Festival and Parade will take place in North Myrtle Beach on Main Street Saturday, March 11, 2017. This one-day, rain or shine event has approximately 30,000 people that come to celebrate the Irish as well as to welcome the coming of spring. A parade begins on Saturday morning at 9:00 a.m., followed by three stages of live music and a children’s area with rides and amusements from 11:00 a.m. until 4:00 p.m. There will be approximately 150 vendors displaying their crafts, services, information, products, and to serve a variety of treats along Main Street. Admission to this event is free and there will be plenty of free parking as well. Grab the family, bring some beach chairs, and come celebrate St. Patrick’s Day and the beginning of Spring! Show off your love of all things Irish by competing in the 29th Annual St. Patrick’s Day Parade & Festival Leprechaun Contest. Entries are judged on originality, creativity, appearance, enthusiasm and energy. Register at the Main Stage @ Flynn’s Irish Tavern before 2:00 p.m. Pre-registration is also avilable at the Festival Information booth (corner of Hillside Drive and Main Street) before 1:30 p.m. Meet at the stairs of the Main Stage on festival site at 2:00 p.m. Contest begins at 2:15 p.m. Enter into the Shepherd’s Pie Eating Contest at this year’s festival on Saturday, March 11th, 2017. First to clear their plate (without using their hands) wins bragging rights and a stylish plaque designed by Coastal Engravers. Register at the Main Stage at Flynn’s Irish Tavern before 2:00 p.m. Pre-registration is also available at the festival information booth (corner of Hillside Drive and Main Street) before 1:30 p.m. Meet at the stairs of the Main Stage on festival site at 2:15 p.m. Contest begins at 2:30 p.m. Ocean Boulevard will be open to vehicular traffic until 8:30 a.m. and is expected to reopen around 11:30 a.m., immediately following the parade. Main Street from Ash Street to Ocean Blvd. will remain closed after the parade and become the festival area. Next PostNext The 2nd Annual Horry County Fair is Coming Soon! Local events	The 2nd Annual Horry County Fair is Coming Soon!